New book, 56 pages, SS1204. 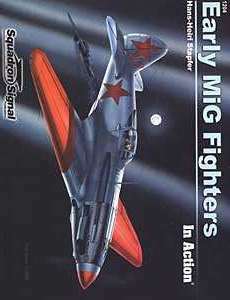 Until the collapse of the Soviet Union in 1991, the MiG Design Bureau had a near monopoly on the supply of fighter aircraft to the Soviet Air Force and the nations within Moscow's sphere of influence. Yet the early designs of Mikoyan and Gurevich are not widely known; the MiG-1 was the fastest fighter in the world in 1940 and the improved MiG-3 was more than a match for the Bf 109F at high altitude. Other early designs included high-altitude fighter prototypes, rocket-powered aircraft and the MiG-9, the first pure jet-powered Soviet fighter. Updated with 7 pages of new material and illustrated with more than 100 photographs, plus 10 color profiles, detailed line drawings, and color covers.